commented on "Few people realise we have some of the world's oldest rock art, which should be registered internationally, scattered through creek beds ..."
Few people realise we have some of the world's oldest rock art, which should be registered internationally, scattered through creek beds through from Ulooloo to Ketchowla and Franklin Stations... featuring petroglyphs etched into rocks, the Tasmanoid people, no longer in our area, gave us a remarkable insight into their rituals, hunting and nomadic lifestyle. Emu petroglyphs give us an idea of where water holes are, tiny delicate depictions of kangaroos, hands and feet in women's places, initiation places suffering from the ravages of time and even from earlier archeologists taking plaster castes... all 44,000 years of humanities connection to Nature. Later peoples to make this landscape their home were the Ngadjuri people, who were still in the area at the time of my forebears as well as in the time of Sir Hubert Wilkins, whose childhood home sat near the magnificent mystical Mt Bryan... used as a burial site, with bones buried under quartz rocks under the towering rock faces. Their dreaming stories were recorded from early elders by ethnologist Norman Tindale in legends such as 'The old Woman and her two dingoes' and 'The eagle and the crow'... this in part, forms the basid of the reason locals are so keen to preserve these national treasures and the country associated with them for future generations. For example, the mystical Mt Bryan and surrounding hills called the Razorbacks, from wind farms, Mt Pullen and the artifacts on surround creek beds from mining. 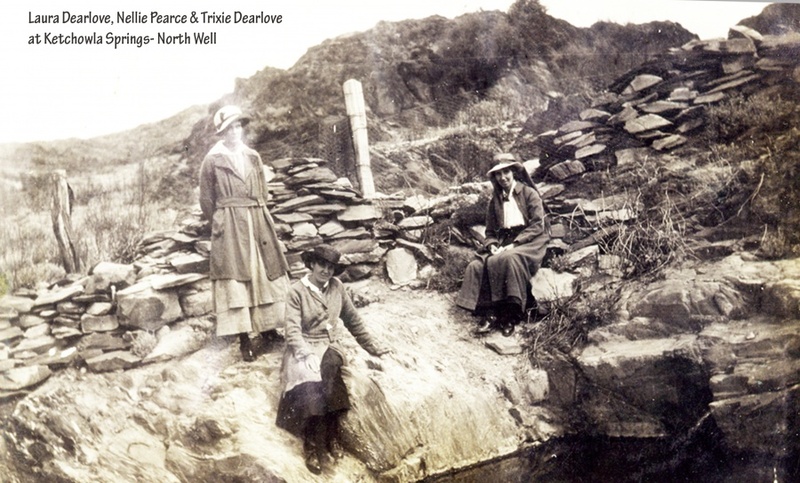 The picture is of my grandmother and the Dearlove sisters at the ancient springs.